Buford Betty: One more day! I'll be back later today with my Moo Goo eats, but just wanted to post a quick reminder to you all to enter my Dave Giveaway! All you've got to do is leave a comment on this post telling me what you'd love to do with your money if you were DEBT FREE! It's fun to dream, so come play! 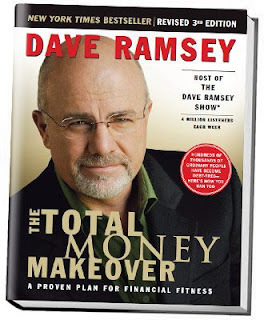 Up for grabs is a signed copy of The Total Money Makeover along with a 3-month subscription to the online TTMM site. Enter by tomorrow! Also, Atlanta pals, don't forget to grab your tickets for Dave's LIVE Event on Saturday Oct 2! It's one afternoon that has the potential to change the course of the rest of your life. It did for us two years ago! Hope to see you there! Here's a clip of an old entry video from one of his past shows. OMG it gives me goose bumps - I'm such a nerd.